THE KRCB FM RADIO 91 HOLIDAY / END OF YEAR FUNDRAISER HAPPENING NOW! 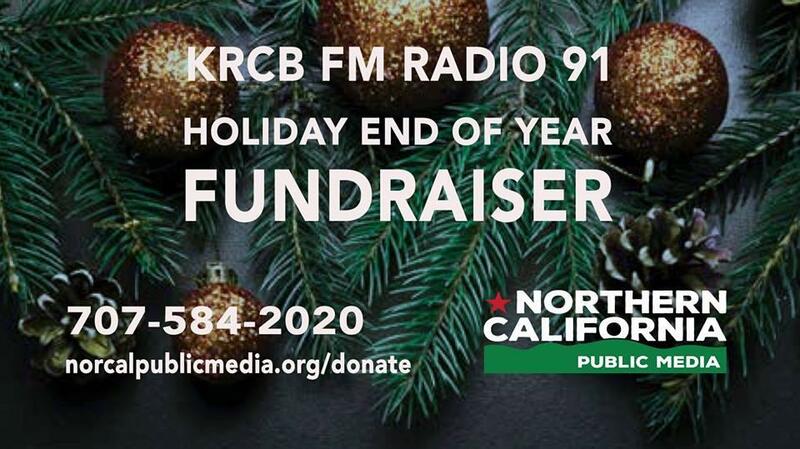 The KRCB FM Holiday and End Of Year Fundraiser is happening NOW! - donate $40.00 - and you can choose from a new Northern California Public Media cap, or a Northern California Public Media t-shirt, or one of the fantastic new KRCB CDs - either the Jazz Connections compilation disc or the Our Roots Are Showing CD. OR you can also choose from any one of the "top-shelf" CDs from Kacey Musgrave, Roseanne Cash, Ry Cooder, David Crosby, Boz Scaggs, Mary Gauthier, Mark Knopfler...or any one of the other fine CDs available at this donation level! - donate $60.00 - and you can choose from the fabulous NPR Socks, the Northern California Public Media Bluetooth speaker; or you can choose 2 "top-shelf" CDs! - donate $100.00 - and we have the popular Emergency Radio - handy for those occasions where you want to know what's going on in an emergency such as power outages, earthquakes, or fires. This emergency radio is solar-powered, also has a hand crank, flashlight, and it can give your phone a charge. There are many other levels you can show your support for KRCB FM - how about $1.00 a day for a year? You can be a sustaining member where you set an amount to donate monthly until you tell us to stop - such as $120.00 per year or only $10.00 per month. Northern California Public Media accepts Visa, Master Card, Discover and American Express. Listen to KRCB FM for other awesome thank you gifts that you can get only by calling (707) 584-2020! You can donate online here, or donate with the FREE KRCB App by touching the heart on the upper right corner of your smart phone, tablet or other smart device. Don't wait for someone else to step up and support your North Bay NPR station - donate now! Donate now and get that "end of year" tax deduction in!